Purchase the Captain Heart Book! “The Adventures of Captain Heart” Home Page! This is the first appearance of a super hero body organ, the heart, with an obesity prevention and heart health message effectively articulated for children 3-7 years-old. The book was written by a Chicago physician and his six-year-old son to help explain this timely topic in an easy-to- understand, well illustrated format. 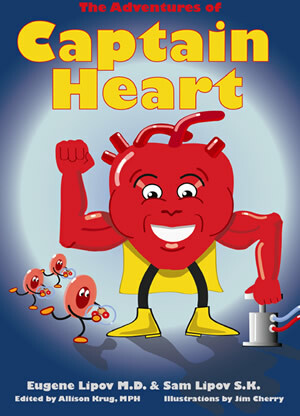 Captain Heart needs your help! Calling all kids, moms, dads, grandparents and caregivers with heart healthy, fun recipes to share! You see, I need your help with sharing some of your favorite HEALTHY recipes for my new cookbook, “Cooking With Captain Heart”. I’m looking for a variety of recipes to include from Favorite Finger Foods, Veggie’s, Main Dishes, Deserts and everything in between!!! Please email them to captain heart captainheart1@gmail.com. Top 10 recipes will receive 50 dollars each and a free copy of adventures captain heart book. Submit Your Healthy Recipe to Captain Heart! © Captain Heart™. Copyrighted & Trademarked. All Rights Reserved.